You’ve had a long hard day and your muscles are sore and tense. Suddenly, across the horizon, you see a misty aquatic paradise. You question your eyes: can this be real or is this just a mirage? It’s not a figment of your imagination– it’s reality and can be easily obtained with the help of Triangle Pool Service. We have been providing quality and affordable pool service and repair in Largo, Clearwater, Palm Harbor, Seminole and St Pete for over half a century. We offer a wide variety of management services for both commercial and residential properties along with exceptional customer service. Whether you have a commercial or residential amenity, it’s vital it stays sanitary and clean to assure the safety of the people who use it. No matter what your property requires, we will manage it diligently. We only employ the most qualified workers when it comes to keeping your water sparkling clean, beautiful and safe. There are numerous variables when maintaining a pool to reach a level of perfection and excellence. We offer extensive pool service and repairs in Largo. 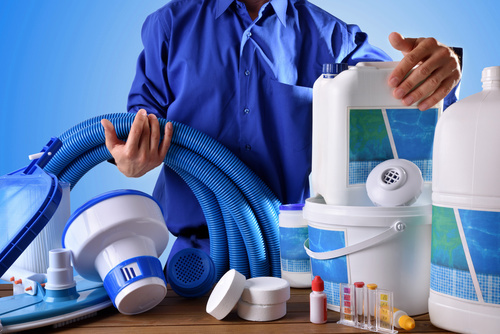 Our services include cleaning and repairing filtration systems and pumps that often become clogged and become ineffective causing the water to become stagnant and unappealing. Part of owning a commercial property is making sure it remains a safe environment. It’s also important that the pool service and repair comes from a professional company. That way, your swimmers remain satisfied and safe. There is an extensive amount of work that goes into commercial property management and maintenance. Keeping a commercial pool up to par and current with the latest innovations is imperative. Especially when creating a peaceful and serine atmosphere for community bathers. We only use the best quality products when maintaining a sanitary and safe environment. Even if you’re the owner of a wading pool, keeping it crystal clear and sanitary is a tedious task. That’s why we offer professional quality pool service and repair in Largo to handle your amenity’s safety and appearance needs. When you hire Triangle services, you can be sure that your aquatic reservoir is safe for swimmers. At Triangle, our servicing staff is comprised of highly trained experts that will work to fit your schedule in the most appealing manner that you see fit. Far too many pool service and repair companies lack our expertise. This often results in either excessive chlorination, which makes the swimming experience irritating and unpleasant. Or, they use less than the required amount of chemicals making the water stagnate and unsanitary. We work hard to keep all of our customers fully satisfied and take pride in our ability to do so. No one cares about the appearance and quality of your amenity like we do. Which is why we implore you to have us handle all of your treatment and maintenance needs so that no one will ever have to swim or relax in an unsanitary water again. Relaxation is a vital aspect of owning such a luxurious home amenity; they are designed and intended to provide you an escape so that you can take a load off and let your aching muscles relax while you float about in your aquatic paradise. Remember, whenever you require expert pool service and repair in Largo, Seminole, Clearwater or St Pete, Triangle has your best interests in mind.